Yadunanda Budigi, senior scientist at Visterra in Cambridge. The company will begin human trials of its flu vaccine in 2014. As we sniffle, suffer, and stress about lurking germs, researchers across the Boston area are developing new ways of fighting the flu. A start-up in Cambridge is making a drug — so far, effective in mice — intended to treat most forms of the flu and prevent its spread. Scientists in Boston are creating vaccines that would fight a variety of strains, so people wouldn’t need to get an annual shot. And researchers in Worcester are trying to predict how the flu virus is evolving so that the shots are better matched to each year’s strains. “I wouldn’t be working on this kind of stuff if I weren’t excited about it and believe that research in these directions will lead to much improved vaccines and therapeutics,” said Stephen Harrison, a professor at Boston Children’s Hospital and Harvard Medical School who is researching ways to improve flu vaccines. The first set of improvements is likely to come from tinkering with existing vaccines. Novartis, whose global vaccine development program is based in Cambridge, is developing additives that will boost the effectiveness of current vaccines. It is also working on a new way to make flu vaccines, without relying on eggs. Current vaccines aren’t as effective for children under 6, or for the elderly — groups generally at the highest risk of dying from the flu. Novartis is now testing a vaccine in children that has an additive that amps up the medicine. The same vaccine has been used safely in Europe for 15 years on elderly patients, said Dr. Vas Narasimhan, global head of development for Novartis’s vaccine unit. 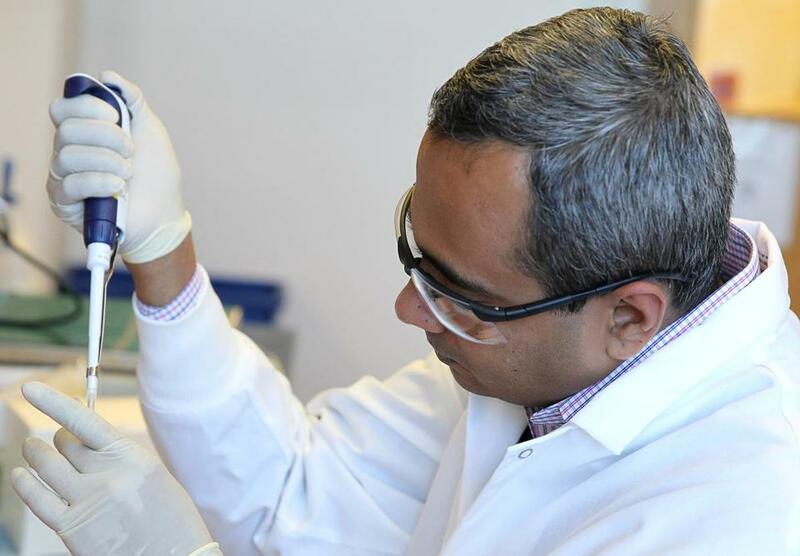 The long lead time needed to culture vaccines in eggs can create shortages when, such as this year, demand for the flu vaccine is higher than projected, said Narasimhan, whose company will begin transitioning away from egg-based manufacturing this year. Every February, infectious disease experts make an educated guess about which strains of flu will hit the United States the following winter, and then design a vaccine against it. So far, the vaccine developed for this year is a good match against the strains of flu circulating in the United States. But it doesn’t always work out that way, leaving people vulnerable even if they are vaccinated. So, Dr. Robert W. Finberg, a professor at University of Massachusetts Medical School, is trying to improve the match between vaccine and strain. He is using gene sequencing to analyze changes in strains as they evolve, and hopes that in another two more years he will have developed an algorithm that will anticipate their evolution. “The goal will be to predict next year’s virus,” Finberg said. Finberg is also getting ready to test a new antiviral treatment called Favipiravir in a trial that will soon open to the public. 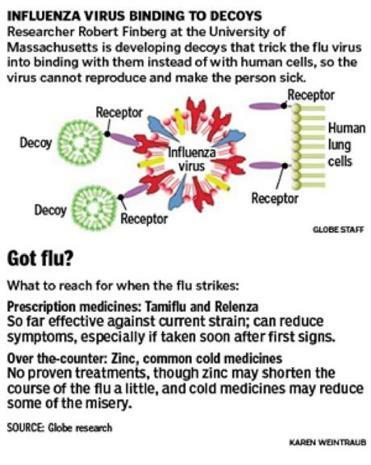 Right now, only two antiviral medicines are used against the flu, Tamiflu and Relenza. Some flu strains — though not this year’s — are resistant to both drugs, so more options are needed, Finberg said. Meanwhile, Visterra Inc. of Cambridge is using a method of network analysis developed at the Massachusetts Institute of Technology to identify key proteins on the surface of the flu virus that are common to influenza A strains, the form that usually causes human misery, said Dr. Donna Ambrosino, the company’s chief medical officer. Once the protein is identified, Visterra designs a drug — a so-called monoclonal antibody — to target that protein, blocking the virus from infecting the human cell. So far, the company has reported positive results in test tubes and mice against a wide range of flu strains and plans to begin human testing in 2014. If shown to work against all A strains, the drug, VIS410, could be used as a treatment for people with the flu as well to prevent infections in the short term, such as during a flu outbreak, Ambrosino said. In November, Visterra announced that it had received $26 million in backing from the Bill and Melinda Gates Foundation of Seattle, Polaris Venture Partners of Waltham, Flagship Ventures of Cambridge, Omega Funds of Boston, and Lux Capital of New York. Researchers would also like to develop a vaccine that prevents all types of flu, or that works for multiple years and eliminates the need for annual shots. Vaccines now target the rounded head of proteins on the virus, which evolve rapidly, leading to the need for ever-new vaccines. About four years ago, Dr. Wayne A. Marasco, a flu researcher at Harvard Medical School and the Dana-Farber Cancer Institute, found that the stalks of the proteins don’t seem to undergo such fast evolution, suggesting they would make a good target for universal vaccines. All of these advances will almost certainly drive up the cost of a flu shot, though developers promise that the higher costs will be justified by the added medical benefits. There is one more area of local research that might someday improve flu vaccines: Robert S. Langer, a professor at MIT, is developing several different ways of delivering vaccinations without the dreaded shot. He is experimenting with using ultrasound to temporarily open tiny pores in the skin, controlled releases that avoid the need for boosters, and patches with needles too small to be felt. “We hope that children and other people who want to avoid needles at any cost will someday be able to escape the flu,” he said.